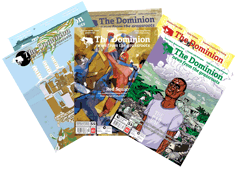 Halifax, February 6, 2014: Onelight Theatre continues its first season as resident theatre company at Alderney Landing with its newest production, Chess with the Doomsday Machine. After returning home from representing Canada at the Fadjr International Theatre Festival in Tehran, the show will launch its Canadian premiere on February 6th 2014. In 1980, a surprise attack on the Iranian city of Abadan marked the beginning of the Iran-Iraq war. Hundreds of thousands of people fled the badly damaged city but a small number of civilians chose to stay, living in a city under siege. Chess with a Doomsday Machine is their story. Developed as an international co-production with artists in Iran and Canada, Chess with the Doomsday Machine, is an original adaptation of Iranian author Habib Ahmadzadeh’s novel of the same name. 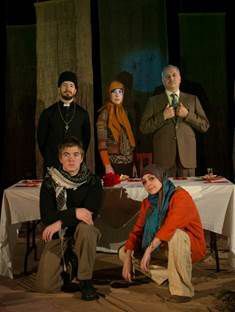 The play, written and directed by Shahin Sayadi, employs a unique combination of English, Farsi, and unspoken communication, to tell the story of the challenges faced by a young soldier as he balances his duty to defend his home with the need to protect a band of misfits who have stayed in Abadan when most civilians have long-since fled. Young men became soldiers, their fathers cooked for the forces and their mothers searched in vain for sons who did not return from the front. Row houses, once the humble dwellings of oil refinery workers, became burned-out bunkers for street-fights. And an ice cream factory storage freezer was commandeered as a morgue – the ice cream passed out to unknowing soldiers.